The Sibelius Academy has created more space for students in the Finnish capital of Helsinki. An additional building at the Academy of Music will soon shine in renewed splendour after renovation. 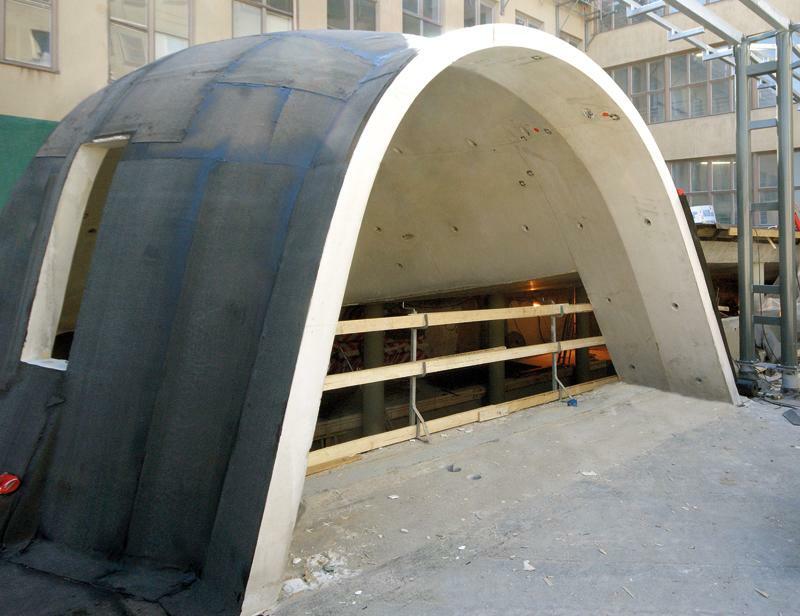 A special feature is the entrance to the cafeteria, formed in a dome shape made from architectural concrete. 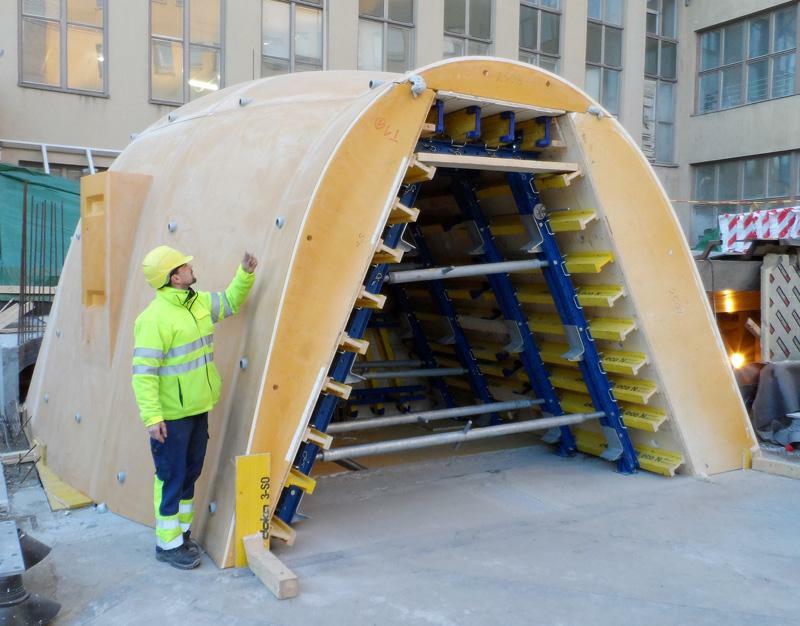 Skanska and the Doka Competence Centre Fair-Faced Concrete have succeeded in creating a shapely composition from exposed concrete using the new 3D moulding formwork DokaShape. DokaShape already met with great approval at the première. Founded in 1882, The Sibelius Academy (Sibelius Akatemia) - named after the Finnish composer Jean Sibelius - is one of the leading music universities in Scandinavia and Europe. Some 1400 students study at the university, following in the musical footsteps of the famous composer. In 2013, the Sibelius Academy merged with the Academy of Fine Arts and the Theatre Academy Helsinki to become the University of the Arts Helsinki. Musicians in the centre of Helsinki have now gained more space due to the renovation of a building that was destroyed during the Second World War and which had previously been used for other purposes. 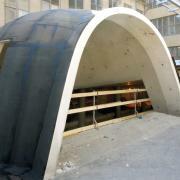 Construction company Skanska built a new entrance to the cafeteria as part of the restructuring, which the architect designed in the form of a dome. Doka's formwork solution was well received for the complex geometry and the exposed concrete quality on the inside. The core of this is the new 3D moulding formwork DokaShape that combines many years of experience in exposed concrete with expertise in special formwork solutions, which was premièred at the Sibelius Academy. The DokaShape concept enables complex geometries to be modelled and prefabricated from high quality polystyrene elements utilising an especially developed synthetic coating. 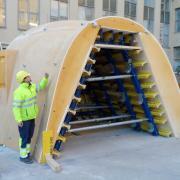 Special large-area formwork Top 50 is used to surround the plastic mould and keep it in position during pouring. This makes DokaShape a cost-saving and easy alternative to elaborate custom constructions. Together with Skanska, the formwork experts at the Doka Competence Centre Fair-Faced Concrete defined the anchor and joint pattern for the cafeteria entrance. The results of the 3D planning were visualised by Doka in the form of a model produced by a 3D printer. A particular challenge in terms of planning and implementation, in addition to the ambitious schedule, was the 3-fold sloping of the surrounding ceiling, upon which the dome rests. The high-capacity load-bearing tower Staxo 100 was used in the construction of this ceiling. The formwork experts adapted DokaShape to fit precisely to the sloping ceilings. Moreover, Doka developed a special construction to counteract the various pressures of the self-compacting concrete (SCC) on the 3D formwork and the buoyancy of the lightweight Styrofoam elements. The complete solution also included a test assembly at Doka's Ready-to-Use Service as well as support and pre-assembly on site. An exposed concrete expert from the Doka Competence Centre as well as a Formwork Instructor supervised construction of the 3D formwork. This ensured that Skanska were able to deploy the formwork quickly and safely. The exposed concrete experts from the Doka Competence Centre work on exposed concrete projects of all kinds, in combination with the international Doka branches. Construction companies all over the world benefit from this solution expertise and are supported with customized products and services from the start of construction through to completion. "Doka convinced us in this challenging project with their rapid and customer-focused formwork solutions. We trust in the competence and efficiency of Doka", says Marcus Mara from Skanska, who is responsible for the concreting work. "We have a long-standing and excellent working relationship with Skanska, which helps us to cope with the challenges on site. The première of DokaShape was a resounding success thanks to the cooperation between Skanska, Doka Finland and the Doka Competence Centre Fair-Faced Concrete ", says Ville Tuulensuu, Sales Manager of Doka Finland. Thank you for your interest - Melodious première for DokaShape. Thank you very much for your interest - Melodious première for DokaShape.